Growing up, you always heard about the American Dream…the loving wife and kids…the nice job…the cute home in the suburbs…and the white picket fence. The times may have changed, but the American Dream is still alive. Except now, instead of a wooden white picket fence, you can have your dream fence with zero hassle. How? 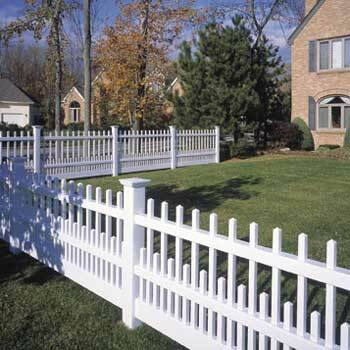 With a white picket vinyl fence, you don’t have to worry about the constant maintenance associated with wooden fencing. Vinyl fences do not require painting. You don’t have to worry about termites. You don’t have to worry about mold and mildew. And your dream white picket fence will stay dreamy for a very long time. Do not hesitate to contact Freedom Fence. Our deck and fence experts are available to help homeowners and businesses select the right design and materials for any fence, deck or home improvement project. If you have any questions about Vinyl Fences, please contact Freedom Fence and Home by calling 443-271-6841 or visit our website. This entry was posted on Wednesday, May 23rd, 2012	at 7:18 pm	. Both comments and pings are currently closed.